A few weeks ago, I shared with you our Summer Bucket List. On that list was hiking as a family. As you know, we have a toddler. 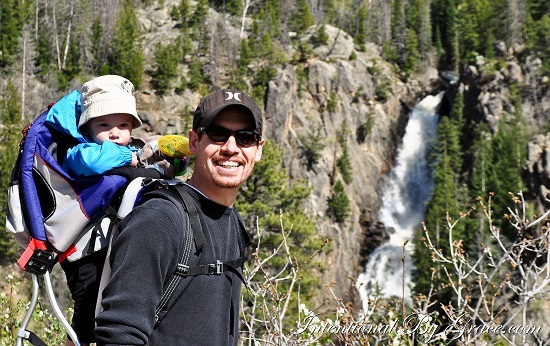 Hiking with a toddler can be a little bit more … well difficult. 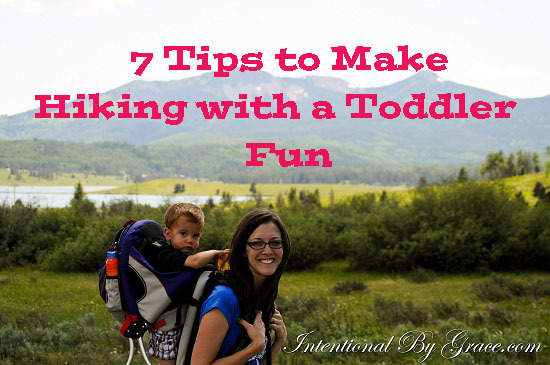 We have taken several hikes as a family, and I thought it would be fun to share with you some tips we’ve picked up along the way to make hiking with a toddler fun. 1. Pack lots of snacks. We like to go on a hike during lunch. Of course, the grown ups will have already eaten lunch, but the toddler will eat his on the trail. We use snack containers (or measuring cups…work with what you have) filled with raisins, watermelon, avocado, grapes, etc. We are loving Red, White, and Blue Fruit Salad for our trail snack. Pack enough to last the majority of the hike. 2. Bring sun protection. We always bring along a hat, sunglasses, and sunscreen. This goes for everyone! You don’t necessarily have to use them all, but it’s good to have these items on hand just in case you need them. 3. Use a hiking pack. Don’t expect a toddler to be able to hike the trail. We’ve found the backpack style carrier to work great. It’s comfortable and has plenty of pockets for us to carry water, sunscreen, and additional snacks. 4. Let them walk. Occasionally, we let the toddler get out of the pack to walk for a stretch. This gives him a chance to get some exercise and stretch his legs. Once he has walked for a bit, we put him back in the pack. He’s usually exhausted and ready to comply by this point! 5. Hand them nature. As we walk, we hand our boy flowers, leaves, sticks, and whatever else we find along the trail that we think he might find interesting. Dandelions and wheat grass have been his favorite so far. 6. Don’t expect to see nature. Kids aren’t necessarily quiet, and we rarely see anything interesting on the trail because of it. We don’t mind because we’re spending time as a family, but go ahead and set the expectation that you will probably be singing Mary Had a Little Lamb or something equally as fun to help your toddler get over a hump. Deer, butterflies, and bears aren’t really into that sort of thing. We like to hike to a waterfall, lake, or something with a view. This way it matters not how loud our children are and the destination is what we’re after anyways. 7. Take regular breaks. Sometimes, we just need to stop and take a breather. Let the toddler explore unhindered for a little while. Drink plenty of water on your stop and replenish your snacks. Plus, until you get in shape, carrying your toddler on your back is more of a workout than you realize. You’ll need the breaks as much as, or more than, your toddler. Overall, just relax and have fun. If your toddler starts screaming, don’t worry about it. It happens to everyone at some point. You’re creating memories as a family, showing them God’s amazing creation, and forming healthy habits that will benefit your family for years to come. Previous Post: « Intentional Conversations: Already Blessed by the Scripture Memory Challenge! Great tips! We have a beautiful place nearby to hike. I haven’t thought about going with my two little ones but may consider…double trouble! Nikki @ Christian Mommy Blogger recently posted…The “Get Healthy” Cash Giveaway! Oh you must give it a try! They would love it! We’ve done quite a few hikes with our daughters (ages 4 and 2). These are all great tips. 🙂 I’d also add that if you have friends with young kids who like hiking, that can be a fun way to spend the day. 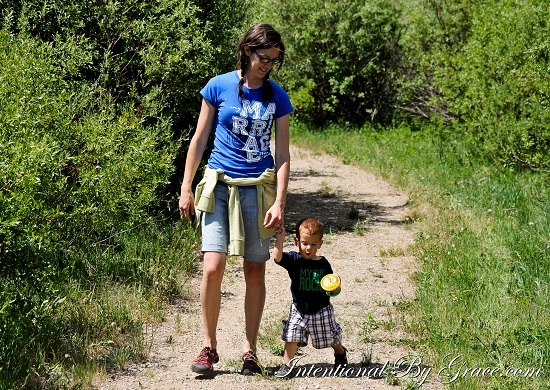 Sometimes toddlers/preschoolers are more motivated to hike if they have a little friend who is hiking. I personally love our Ergo baby carrier for hikes, as it holds the baby very close to me and I can carry either of our daughters in it (they take turns as they both like to ride or walk, depending on how much energy they have). We have tried to go camping in a tent each year with our children. We started with little, familiar trails and have learned to lower our expectations… or maybe jut make them realistic 😉 We start a packing pile early on to make sure we don’t forget things (and have a list that is taped inside our camping rubber-made container(s) that we keep adding / changing from year to year). Now that our children are 5, 3 and 2, they are excited to go. As we look back on the pictures from the precious years, it only makes us smile, and I barely remember all the rain, tears and dirt. Thanks for the post. 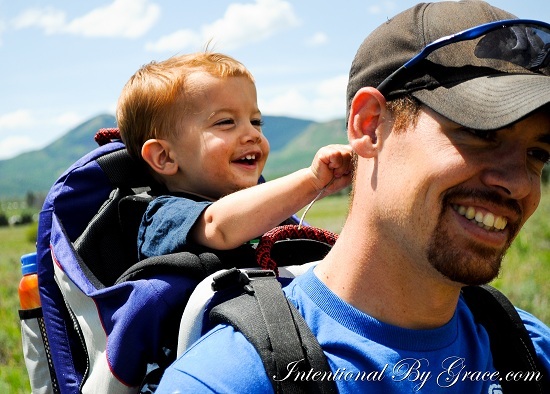 It is great to hear that other families want to intentionally experience God’s beautiful creation with their little ones too. Thanks for sharing, Janelle! 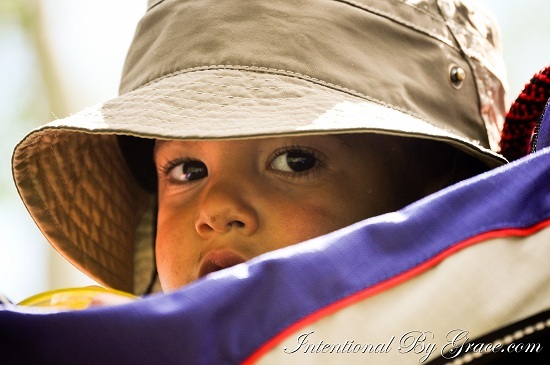 We just recently took our then 16 month old on a tent camping excursion. It was such a fun experience. We didn’t take any toys, took just enough food, and piled into our two person tent. My husband and I fell asleep while our boy bounced from one sleeping bag to the other. He thought all the bouncy stuff was like a blow up bouncy house. He eventually snuggled in with us, and we all nearly froze. Morning came and we were tired, sore and stiff, but everyone was still smiling. We took a few hikes and got really muddy, but it was so worth it. We’ll probably plan another trip within the next month or so. So fun! Great tips. Love your blog. Today I award you the Very Lovely and Inspiring Blog Award. Congrats! As a family of four (5 and 2 years old), we do quite a bit of hikes with the kids and I do agree, it is a workout. But we love this kind of workout because like you said, it is a time where you get to spend some quality time with kids and not something watching TV or on the computer. Our hikes now are mostly about the journey and not so much with the destination anymore, but we are still glad we get to go for hikes or camping trips with the kids. Bringing some of their toys too can also help during break time. These are great tips, by the way. Thanks for sharing! It’s definitely more about the journey than the destination! I love that!